Bathroom faucets come in a variety of styles and finishes, the most common faucets are a 4" minispread , 4" centerset , and a 8" widespread sink faucet. Before purchasing a new faucet check to verify what style of faucet fits your sink. Standard bathroom sinks have three holes for the faucet, these holes are spaced 2" on center making the outer two holes a distance of 4" on center. If on your sink the distance between the two outer holes is 8" you will need a 8" widespread faucet. 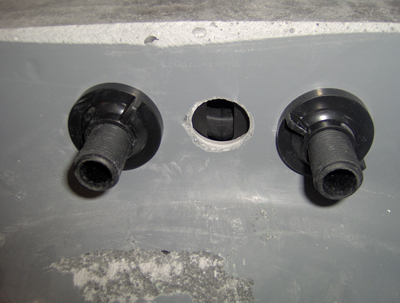 On standard bathroom faucets the two outer holes are for the water supply connections and the middle hole is for the pop up drain assembly vertical push rod. The tools required for replacing a bathroom faucet are a pair of chanel lock pliers, crescent wrench, and a small bucket or large bowl to catch the water while disconnecting the water supply lines. 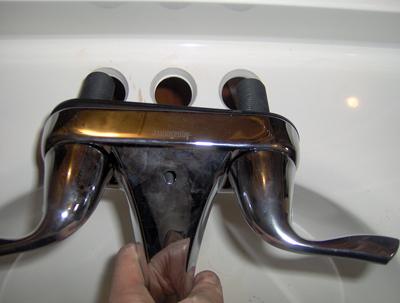 Before installing the faucet to the sink, make sure the plastic gasket is around the base of the faucet correctly. Insert the faucet into the sink. Install the faucet retaining nuts and hand tighten. If necessary tighten a quarter to half turn with a pair of channel-lock pliers to hold the faucet from moving. Connect the water supply lines to the faucet. Insert the vertical push rod into the hole on the top of the faucet, under the sink install the pop up drain clevis to the vertical push rod. 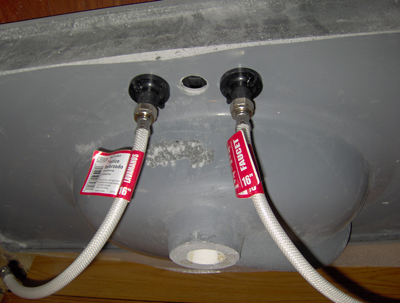 Use the metal retaining clip to connect the pop up drain clevis to the horizontal push rod. Close the hot and cold water shut off valves and diconnect the water supply lines from the faucet. Remove the faucet retaining nuts that fasten the faucet to the sink. Then remove the faucet from the sink.